Beavers have a reputation for hard work but not high intelligence. Their big scaly tails, perpetually wet fur and oversized buck teeth scream, “Awkward.” I once watched one trying to raise the level of a huge cement dam one stick at a time. Risking a tumble to his death over the spill way, he would swim with a stick in his teeth, release it to be washed over the dam edge and then swim back for another sacrifice. That was an Oregon beaver, not one born on the glacial moraine. Our local boys must be more intelligent. They outsmarted the U.S. Forest Service. I have the wet boots to prove it. 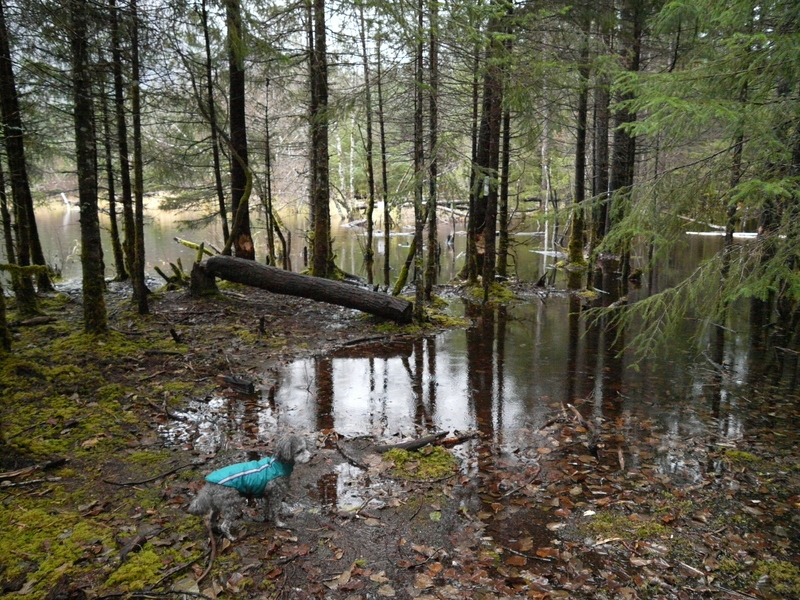 The soaking happened today, as Aki and wound our way through glacier moraine and troll woods to avoid an increasing number of beaver flooded trails. The dog showed little enthusiasm for the venture. I blamed the pounding rain and promised her that we will soon be protected from the worst of it by a thick forest canopy. She still hesitated then took up station at my heals as she does when smelling danger. A few minutes later she shot ahead. The rain continued so a strange smell or one given off by a bear must have caused her timid behavior. We emerged from the woods onto Crystal Lake. Across the lake a trail runner and his dog forded 100 feet of flooded trail. His trainers sent waist high splashes with steps that submerged his legs to mid-calf. Aki would have to swim it and I am tired of wet boots so we planned another route home. This took us to ground zero of the beaver vs. Forest Service war At the head of Crystal Lake last spring the beavers built a massive dam that turned the area around the lake into a water park. With the Forest Service slow to react, vigilante hikers started dismantling the dam, stick by stick. This concerned the Feds, in part because the dam kept silver salmon out of Crystal Lake where State Fish and Game had just planted a bunch of land locked king salmon. Both sets of biologists warned that the two specifies could not safely share the same water. Last Fall the Forest Service thought they fixed the problem by running a water pipe under the dam designed to reduced the lake water level without allowing a silver salmon invasion. With the pipe in place the lake level dropped and the trails dried out and hikers credited the Forest Service with a win. The beavers retreated to their winter dens and planned next summer’s campaign. This summer, rather than blocking the Forest Service pipe, the beavers built a new higher dam 100 feet down the outlet stream from the old dam. Water backed up from their new edifice over the top of the old dam and onto the surrounding trails. My feet and Aki’s undercarriage are soaked from our efforts to reach a dry trail on the other side of the flooded area. What next? Will the Forest Service try to undermine the new dam with another pipe? Will the beavers respond with another dam further down stream? Will my boots ever dry out? 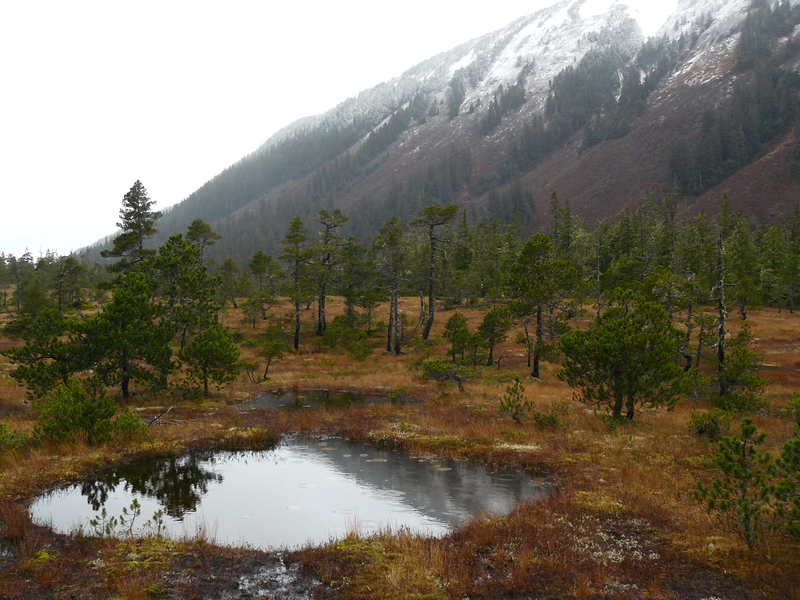 This entry was posted in Aki, Dan Branch, glacier moraine, Juneau, Kwethluk, Nature, Southeast Alaska on October 30, 2011 by Dan Branch. Today an autumnal tide flows over the Eagle River meadow. In minutes it will peak at 19.7 feet. 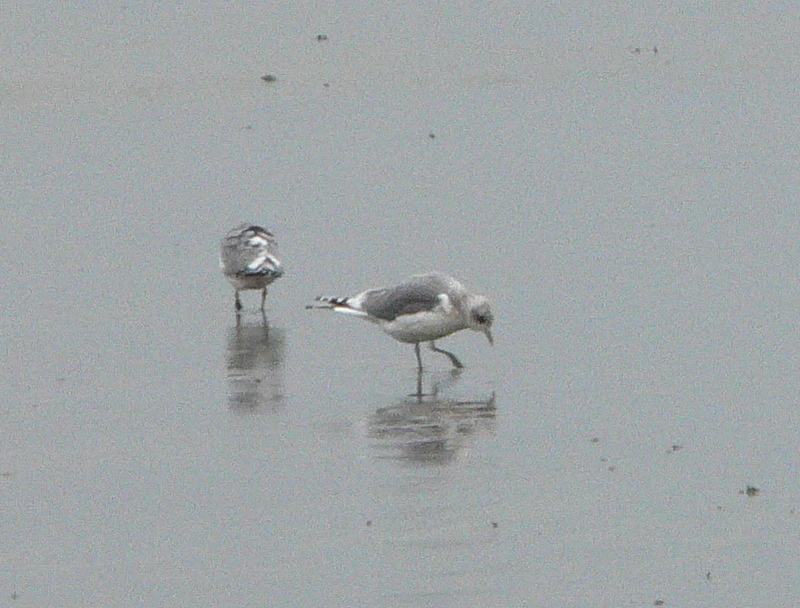 Even now it robs the gulls of all their usual resting places. During this evening’s ebb, it will wash the meadow clean of decaying salmon carcasses and any other flotsam carried here by storm flooded streams. Not content to appreciate the broken storm light reflecting off the flooded meadow, I try to conjure it up in high summer when lupines, paintbrush and shooting stars flowers formed colorful colonies on its green field. We started this hike during the tail end of a fall storm. Aki had to stop repeatedly to shake off water. While I waited for the end of each shimmy, I looked at stubborn hold outs of summer displaying their few remaining leaves high even as they fade from yellow to brown. Below, their practical neighbors have already tucked themselves away under crispy brown covers. One blueberry bush sports a yellow leaf and 20 new blossoms. I would join the forest gossips in condemning this waste of life force but the pure white flowers, each an elongated Japanese lantern, sway with beauty in the rain. Riverbank alders, wise survivors all, are bared for winter. Even here one tree holds a dead brown leave over the water. 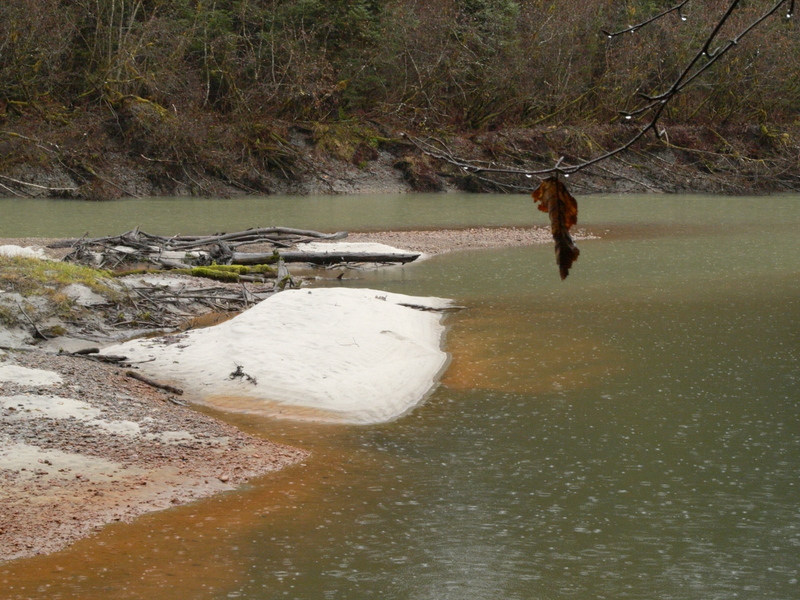 Cupped to catch the rain, the lone leaf releases a series of drops into the river below where each mixes with green glacier water and that colored red by running over iron oxide. 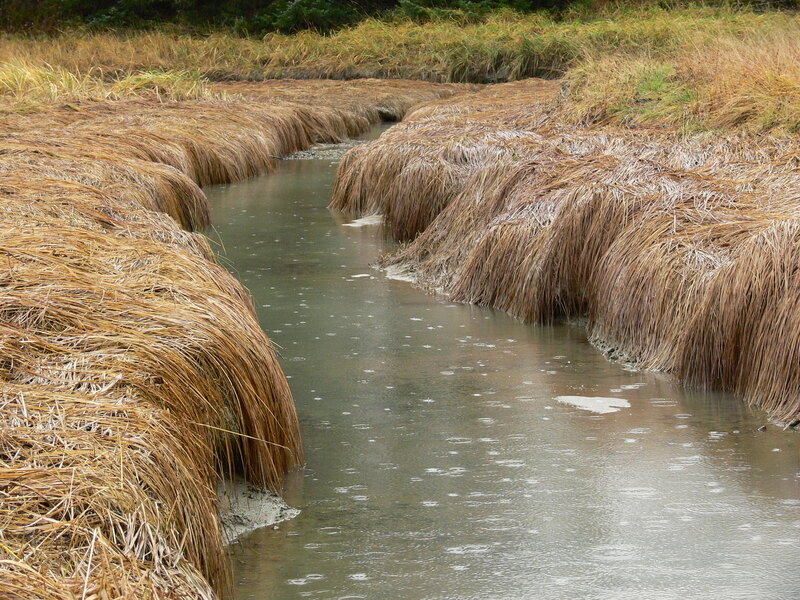 The rain stops as we reach river meadow but the tide soaks Aki. She is running up and down a thin strip of river bank sand, stopping only to track the progress of a seal in the river. It and a couple of clumsy sea lions ride the flooding tide before us. Aki startles one of the sea lions by jumping over driftwood and it crashes under the water like a diver that never does well in competition. The dog appears to swell with excitement, if not pride, and dashes along head of me on the trail, now flooded by the tide and swims over it to a patch of dry meadow. It must be pride that animates her for she turns back and splashes back to me on the same inundated path. Having witnessed the folly of prideful flowers, berry bushes, and now Aki, I choose a humble path back to the woods. 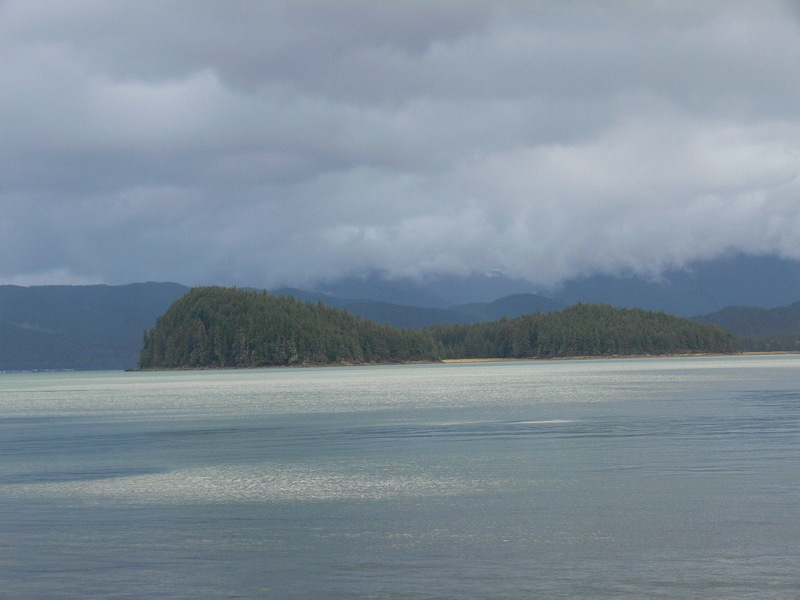 This entry was posted in Aki, Dan Branch, Juneau, Kwethluk, Nature, peaceful isolation, Southeast Alaska on October 29, 2011 by Dan Branch. With wind and rain in the forecast we head out to the sheltered trails of North Douglas Island. The darkness promised by a walk through October woods is the price we are willing to pay for its shelter and a brief glimpse of its storm pounded beach. When the clouds lift to reveal new snow halfway down the island’s mountains I change the plan and head to the alpine thankful that Juneau’s tight topography offers mountain and sea trails within 30 minutes of Chicken Ridge. I hope to track the first snow of the year but the rain has driven it off the meadow and into a retreat up the bordering mountain ridges. No rainbow arcs over the meadows and forest this time but we still find color. A stiff mountain wind presses down the now golden grass to reveal patches of moss the color of Claret. 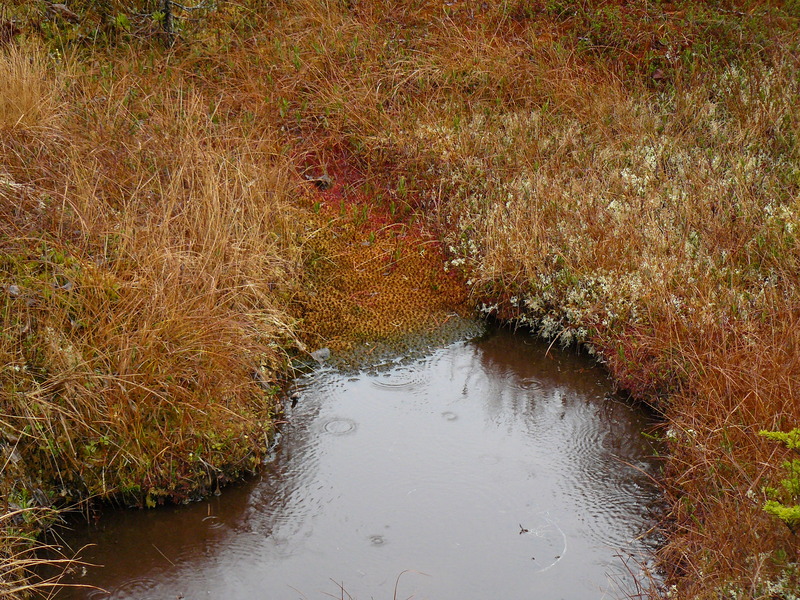 Three round bog cranberries lay on the moss, still tethered to their tiny green vines. You cannot see the vines until close enough to pluck the berries. I harvest two and enjoy the tartness released with the first bite. Aki leaves the third berry for birds. She prefers the sweeter low bush blueberries. Sadly none remain. Other tiny plants display fall reds and oranges but except for a few high bush blueberry bushes sheltering along the tree line, the larger deciduous plants stand bare. The exposed blue berry brush, as if chilled by the storm, have darkened to a rich red. Last week we found one or two bog rosemary plants in bloom. Now their perfect magenta flowers have faded to a dead brown as if mummified by the cold. Aki doesn’t share today’s agenda with me just continues scanning ahead for smells, She stops to show impatience when I take too long over the pond reflections or some other foolishness. One time she starts to follow a faint trail onto the meadow but stops a few feet in as if by a wall. She pees often to mark our passage. When I stop to make water she dashes to my side to stand guard. Touching, if a little odd. 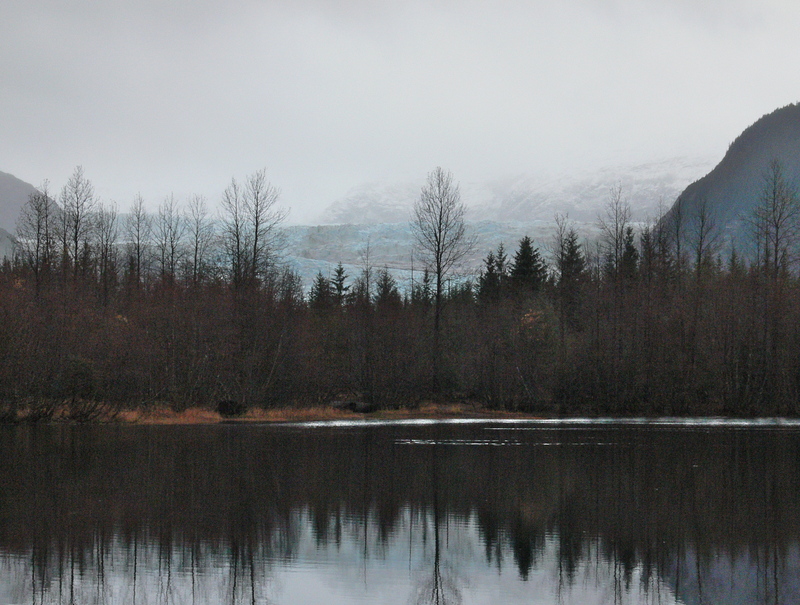 This entry was posted in Aki, Dan Branch, Juneau, Kwethluk, Nature, Southeast Alaska on October 26, 2011 by Dan Branch. On a trail picked only for its handy location we find some surprises this moist morning. 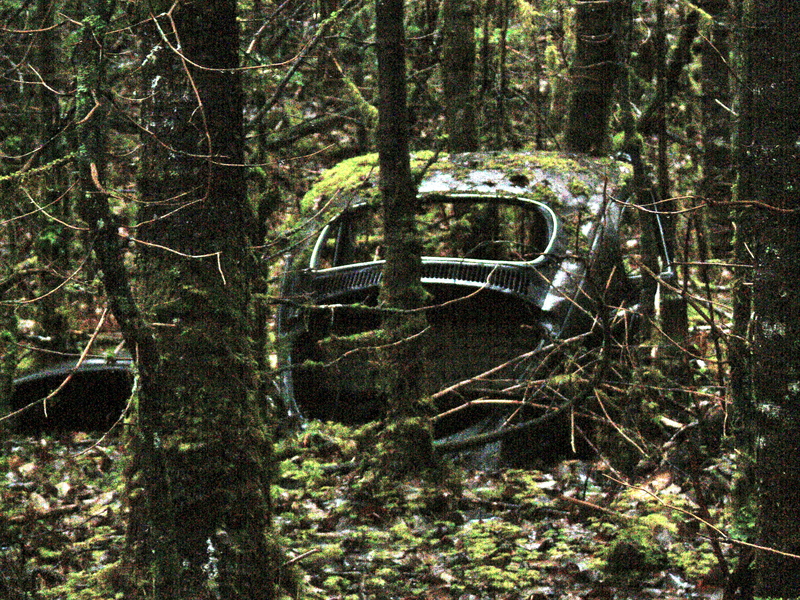 Ten minutes in we spot the moss covered body of a 60‘s vintage VW Beetle boxed in by trees. It makes me think of Harry Potter and also of an abandoned Tlingit village. That the VW appears to have become one with the woods makes me think of Harry Potter’ enchanted Ford Anglia skulking about the Forbidden Forest. That an alder shoot may soon pop up through the sun roof reminds me of the abandoned village I once reached by kayak. Before Aki. I was paddling with a friend from the west coast of Prince of Wales Island to Sea Otter Sound. We stopped for lunch on a smooth beach. We didn’t realize the beach once served a village until we spotted the platforms of two long houses reaching from the woods almost to the beach. Those who peopled this village believed in allowing totem poles to age to nothing while standing in the spots they were first raised. At that time I dreamed of finding such totem poles. When the boxed in VW Beetle drove around Juneau, Tlingit and Haida people began moving the old poles to climate controlled buildings where they could be preserved for future generations. The last pole had been moved from this village site the winter before my visit but we did see platform homes scattered about the old village site. Each home had been fashioned with hand adzed boards. Some were little more than raised platforms but one still had its wide flat board with an oval opening through which people once entered the home. It also had a vertical wooden panel at the center of where the rear wall once stood. These boards had supported alone a center beam. Luck or providence had encouraged a young spruce to grow up through the floor boards until it supported the weight of the center beam as it rested in a fork formed by trunk and upper branch. One end of the beam rested gently on the vertical front panel. After musing for a few minutes about the village I start to explore the VW further but Aki shows impatience so we move deeper into the forest covered moraine. Three blasts from a 12 gauge shotgun sound as we approach Moose Lake. Aki follows me cautiously to the water where we see the wakes of ducks swimming from the hunter. No dog splashes after a downed bird so he must be used every shell in his chamber without gain. There is a strange beauty in the sound of a 12 gauge being fired over water but Aki doesn’t appreciate it. At her insistence we abandon the lake for a path through a thick willow copse and enter a land flooded by beavers. The trail is now under water so we do a work around through the surrounding troll woods. After regaining the trail on higher ground we take it to the paved road to Mendenhall Glacier, which we cross and then enter some woods we have never traversed. Suckered in by its open appearance we soon find ourselves in another forbidden forest. Our goal, to reach the Powerline Trail, proves hard to secure. The terrain turns hilly and each low spot is choked with tangled alders. We cross a small water course with no business being there. 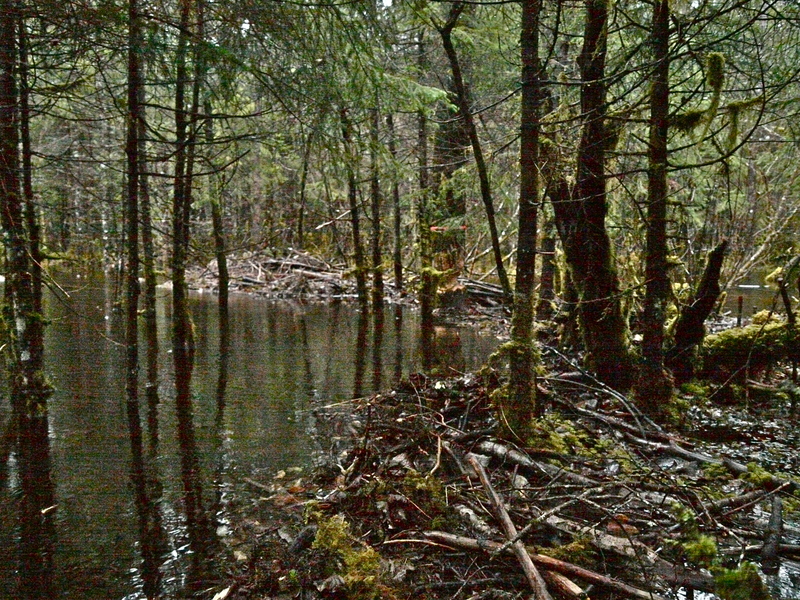 Lower alders reach across it and thick moss cover the rocks I must use for the crossing. Aki crosses first, flying from my hand to the ground on the far side. I follow but only with help from a strong overarching alder branch. The terrain changes after the creek crossing—opening up in a mossy land where small fields of white lichen grew as if in planted fields. We find an empty beer can while still far from road or trail. Otters use mossy country like this for their picnics and I wonder if they have a taste for cheap beer. Aki disappears just before we reach the trail and returns with the look of a dog wishing for the familiar. She gets it minutes later when we find the car. 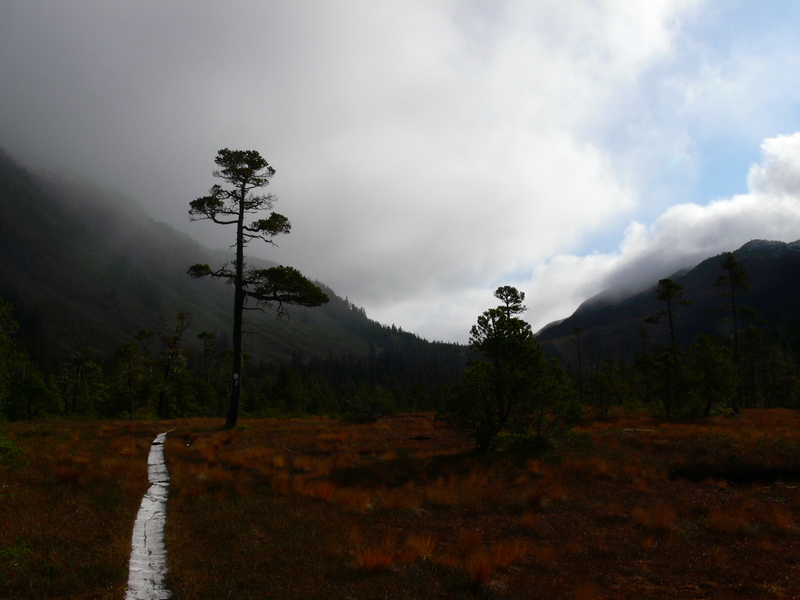 This entry was posted in Aki, Dan Branch, glacier moraine, Juneau, Kwethluk, Nature, peaceful isolation, Southeast Alaska on October 23, 2011 by Dan Branch. I rarely see Aki so stirred up. She runs, upright tail prestissimo, up and down the river bank. At the end of each lap she sniffs and then stares out into the river current. She must scent the shy seal I saw when first cresting this grassy bluff. Aki didn’t hear or see it. A wall of dead grass blocked her view of the river when I saw the seal and it slipped below the surface without a sound. We wait for ten minutes, me with the camera ready, the now spent Aki panting by my side, for the seal to resurface. All we see is a raft of Bufflehead ducks and a strange circle form on the river surface as by a seal’s nose raised just enough to breathe. Downriver a self absorbed gang of gulls trot about on an emerging sand bar, admiring themselves in the mirror like surface of the bar. We see no other signs of feeding. An eagle flew over as we left the car this morning. It landed in a riverside perch and sang out complaints to the rain. Any eagle with imagination or at least some inside information would be heading north to the Chillkat River to feed on the late run chum run. The Eagle River party is over. Autumn advances rapidly now. What fall color remains fades quickly on the approach of winter darkness. It’s not all bad. Devil’s Club leaves no longer block the old river trail so we take it to the secret garden Aki and I stumbled into on Midsummer. Its once green ferns have died back to tough brown husks. We find one red huckleberry, still moist and fresh. Some yellowing leaves still cling to the same bush but on one small shoot flower buds swell. One has burst into full bloom—a tiny Japanese lantern hanging in the rain. Is each huckleberry bush a confederation of independent twigs? We return to the main trail and find it covered with fallen cottonwood leaves. Crisp even in this downpour, they still crackle under foot. I shuffle just to hear them fly with each boot step then stop in see them sail away from Aki’s paws. May I never outgrown the need to splash in puddles or crash through fallen leaves. 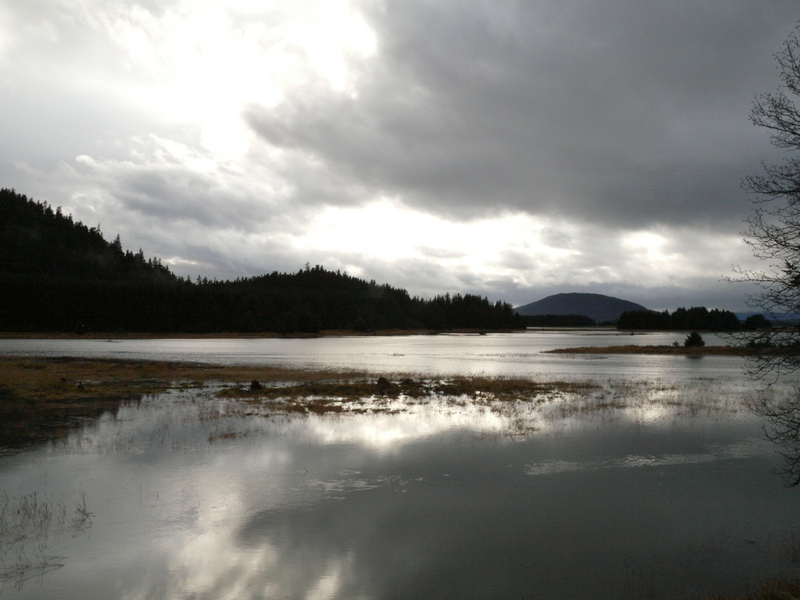 This entry was posted in Aki, Dan Branch, Juneau, Kwethluk, Nature, peaceful isolation, Southeast Alaska on October 22, 2011 by Dan Branch. Russia transfered the Alaska Territory to the USA 144 years ago today. Happy to be part of America, many of us take the day off from work. At first it looked to be a day best spent in the museum. A nasty rain storm had hammered Chicken Ridge all night and didn’t slow down until mid-morning. That’s when Aki and I drove out to North Douglas for a low tide beach walk. The rain holds off as we pass through a tunnel of alder trees and on to the beach. Weak shafts of sunlight brighten irregular patches of the water near Smugglers Cove but disappear as the wind builds. Storm darkness moving up Lynn Canal quashes any hope for blue sky. Through a shower of wind blown alder leaves we watch the tendrils of a serious rain squall dangle over the sea. Driven by a south wind the storm heads north toward Haines. Only its edges will touch us—-wind mostly and a back eddy of brief rain. Surf builds on the shore as we round the main point. Its too small to disturb the large colony of gulls and crows hunkered down on the point. Nothing will move them to flight, not even my clumsily approach on rain slick rocks. The sea is empty beyond the gulls. No boats, planes, sea birds or cruising eagles. We hear rumors that sea lions are fishing off shore but never see them. We usually see ravens and eagles here jockeying for perches in the spruce lining the beach. Today a lone eagle could have his pick of places. An alder in full leaf lies across the beach path and I wonder if it fell during last night’s storm. Standing at what was once the tree top I take a bird’s eye of the tree. Cones for spring and miniature leaves fill the highest branches that are wrapped in unlucky lichen and moss. While some trees and bushes still show fall color I am drawn to fallen leaves stuck to the wet beach rocks and cliff sides. 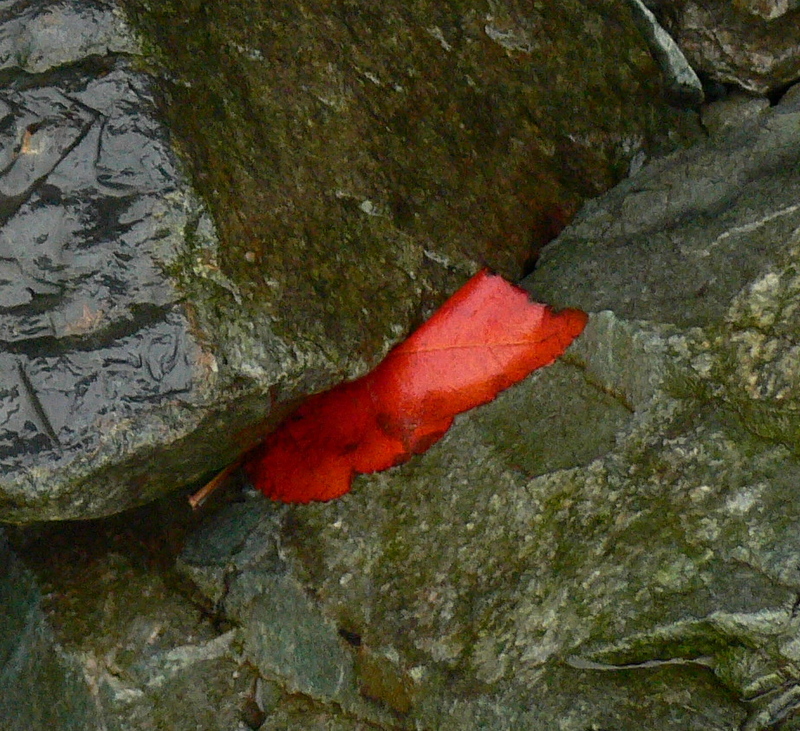 One strong red crab apple leaf appears to hide from winter between two flat surfaced stones. I am also drawn to a field of basketball sized rocks that have been rounded by the sea. They remind me of the story the architect I.M. Pei told how his father planted large rocks in the sea to harvest them 15 years later after the currents had made them something to admire. I can see the beach as a sculpture garden—a place to display the sea’s work. Its currents have decorated the beach at the high tide line with long golden brown rolls of sea weed and purple middens of empty mussel shells. The sea’s storm surges have pull sharp edges rocks from the cliffs to mix with surf rolled pebbles in interesting patterns. Only the boulders left by retreating glaciers stand against the currents. Even these are incorporated in the sea’s. Aki uses her nose, not eyes, to appreciate the ocean’s work. She adds to it with a lift of her leg. This entry was posted in Aki, Dan Branch, Juneau, Kwethluk, Nature, peaceful isolation, Southeast Alaska on October 18, 2011 by Dan Branch. We only receive one hour of light this weekend and spend it watching a rainbow die. Sadly, Aki the shortsighted can’t see the arcing band of color but she is still enriched by the hike through these mountain meadows. She is all nose to ground for smells. As residents of the rain forest, we are forced by circumstance to appreciate the subtle beauty of grey. We also thrill by unexpected sunshine appearing after a rain shower. Each simple gathering of dead meadow grass merits preservation in a digital format. Today, even before the rainbow’s birth, sunlight flooded the meadows beneath dark low hanging fragmented clouds. Columns of spruce trees marching up the mountains bridged the sunny meadow with the cloud obscured mountain ridges. When I am already snap happy from this mixture of lights and darks, the rainbow appears as a faint swipe of color over the meadow. Even in infancy it challenges me like the richest item on a dessert cart. I turn away from it and walk into a light flurry of superfine snow. Each tiny square flake reflects a prism of light and I wonder if I am walking through another rainbow. The flakes must evaporate before hitting me. I can’t feel them on my skin and they don’t moisten my black rain gear. When Aki barks at something behind me I turn and see the rainbow now a strong arc of core colors stacked on top of each other. For the next twenty minutes, as it pulses weak and strong, I try to capture it with the camera first as a streak of color fired from a forest cannon. Later, when the trail moves out of the woods and onto a meadow, only the right rainbow’s half appears arcing down from the clouds. It dies on the meadow, pulsing strong than weak then strong again until fading to nothing. The rainbow was not a live thing, just a mixture of moisture and fickled mountain light. You don’t morn a rainbow, just the departure of it’s beauty. 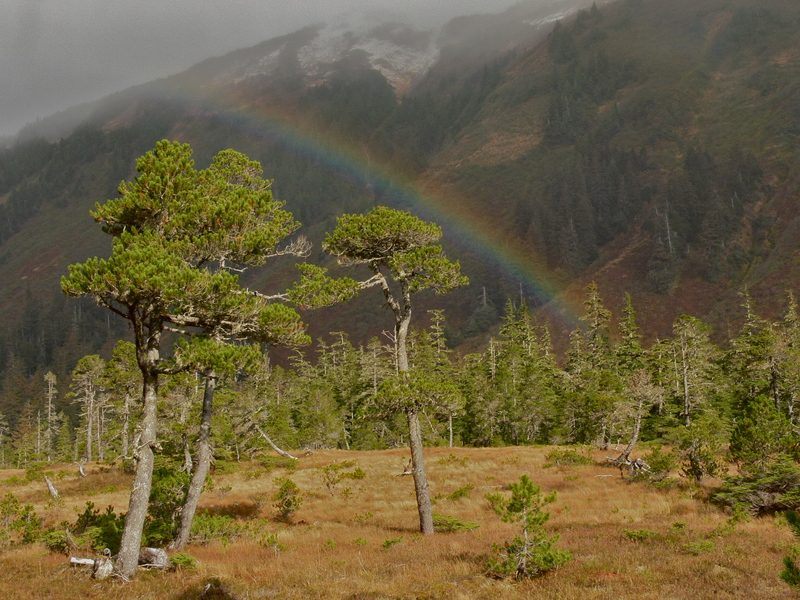 This entry was posted in Aki, Dan Branch, Juneau, Kwethluk, Nature, Southeast Alaska on October 16, 2011 by Dan Branch.